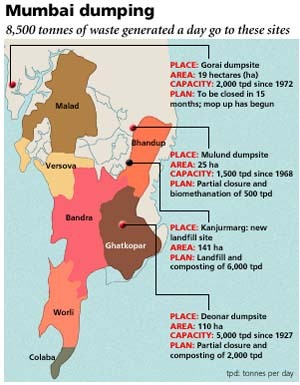 The Municipal Corporation of Greater Mumbai (mcgm) is expected to spend almost Rs 500 crore to develop waste processing technologies and scientifically manage its dumpyards at Gorai, Deonar, Mulund and Kanjurmarg (see map Mumbai dumping). Infrastructure Leasing and Financial Services (il&fs), Mumbai-based consultants, have prepared the plans. But experts say the project will just be a drain on mcgm's finances. According to mcgm, work has already begun on the Gorai dumping yard, which will be shut in another 15 months. The project, costing Rs 38 crore, has been given to United Phosphorus Limited (upl)--an agro-chemical company--in partnership with the Netherlands-based Van Der Wiel, a company specialising in civil infrastructure and environmental technology.Composting facilities are planned for Deonar, where 2,000 tonnes of waste per day will be managed. A biomethanation plant to process 500 tonnes of waste per day will be set up at Mulund and 6,000 tonnes of waste per day will be taken to Kanjurmarg for composting, says R R Markandeya, deputy municipal commissioner, mcgm. The corporation has opened the bidding for these three projects. "Work at these sites will begin only after monsoons and after the operators have been decided upon," says R A Rajeev, additional municipal commissioner, mcgm. Almitra Patel, member of the Committee for Solid Waste Management, appointed by the Supreme Court in 2000, is sceptical of il & fs's expertise and mcgm's move. "There are cost-effective and decentralised waste management technologies available. But mcgm is not adopting those," she says. 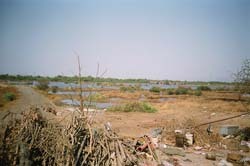 A pilot project funded by mcgm, for instance, was carried out by Mumbai-based Vini-Agro Private Ltd in December 2003 on a 1-hectare (ha) plot at Gorai, where a 6-m waste-heap was brought down to ground level in just 40 days using windrow methodology (see box Gorai experiment), but was not followed up. mcgm instead is opting for methods that can pose potential hazards. Gorai Unviable According to the il&fs report, some waste will be relocated internally to level the area when the dumpsite closes. The landfill will then be capped with an impermeable layer of gravel, silt and high-density polyethylene to prevent water from seeping through. Environmental mitigation measures include collection and treatment systems for landfill gas and leachate, development of green belt and landscaping including green cover over the dumpsite. Capping will lead to serious problems, says Patel. "Capping a large mound of garbage that is not scientifically engineered, with no secure base lining means leachate will get into groundwater and poisonous gases will be released over a period of time. This happens because decomposition in the absence of air means sulphur is not allowed to combine with oxygen to form sulphur dioxide, which instead turns into hydrogen sulphide," she says. She fears a Malad-like situation. Malad residents are facing the consequences of capping a dumpsite and building residential complexes on it. It violates the Municipal Solid Waste (Management and Handling) Rules, 2000, which says that "closed landfill sites after fifteen years of post-closure monitoring can be considered for human settlement or otherwise only after ensuring that gaseous and leachate analysis comply with the specified standards". But the dumpsite closed in 2001 and was inhabited within a year or two, says Patel. Residents complain of toxic gases and other health hazards. In November 2004, the Bombay High Court had directed mcgm to carry out bio-remediation at Gorai but the plan does not mention this. "How the il&fs plan proposes to implement leachate collection systems is not clear. There is also no clarity on the gas collection system at Gorai," says Amiya Sahu, president of the National Solid Waste Association of India. upl did not respond to repeated queries. Also, the plan is not cost-effective says Birju Mundra, director, Vini-Agro Pvt Ltd. "Between December 2003 and February 2004, 61,229 tonnes of waste in Gorai was successfully treated at a cost of Rs 9.79 lakh. But the figures arrived at by il & fs are much higher. For instance, a 2006-il & fs report says the total quantity of waste lying in Gorai dump is 1.76 million tonnes for which the quoted cost of closure is Rs 23 crore. If this waste was bio-mined using the Vini-Agro method, it could be stabilised for around Rs 3 crore. It's pretty clear which option makes more economic sense," says Mundra. The cost of closure has risen to Rs 38 crore. Spread over 141 ha, the Kanjurmarg dumpsite is adjacent to the backwaters of Thane creek, which is rich in mangroves. It was saltpan land, now used for fishing. Acquiring the site, is in contravention of the solid waste rules that state "The landfill site shall be away from habitation clusters, forest areas, water bodies, monuments, national parks, wetlands and places of important cultural, historical or religious interest." il&fs defends itself saying it has accounted for this by strengthening and raising the boundaries to 1.5 m. The plan states "The observed high tide watermark is 0.9 m. All processing facilities and landfill area will be filled up to a level of 1 m to ensure that the floor level at these units is above the highest high tide level (0.9 m)." But the solid waste management committee's report says a dumpsite should be 3 m above the local groundwater level, wherever possible, failing which, the site may need to be raised. Thus, the 1-m elevation is not in compliance. mcgm is also planning to plant more mangroves in adjacent creeks to make up for loss of mangroves in Kanjurmarg, says Markandeya. Mulund will get a 500-tonnes-per-day biomethanation plant for treating hotel and market waste. But mcgm has not clarified how it will be segregated. It has also refused to divulge project details. "Biomethanation plants should not be more than 30-50 tonnes per day. It is difficult to obtain such large quantities of waste without contamination from plastics and metals, even if it is only collected from markets and hotels," says Asit Nema of Greentech Environmental Systems, a Delhi-based ngo. The il&fs report also does not reveal how much gas will be generated or how it will be used. The Denoar project too is shrouded in secrecy. mcgm has big plans. "We want to take Mumbai's cleanliness to international standards by adopting the best practices," says Rajeev. But Patel feels the plans are just a recipe for more disasters.